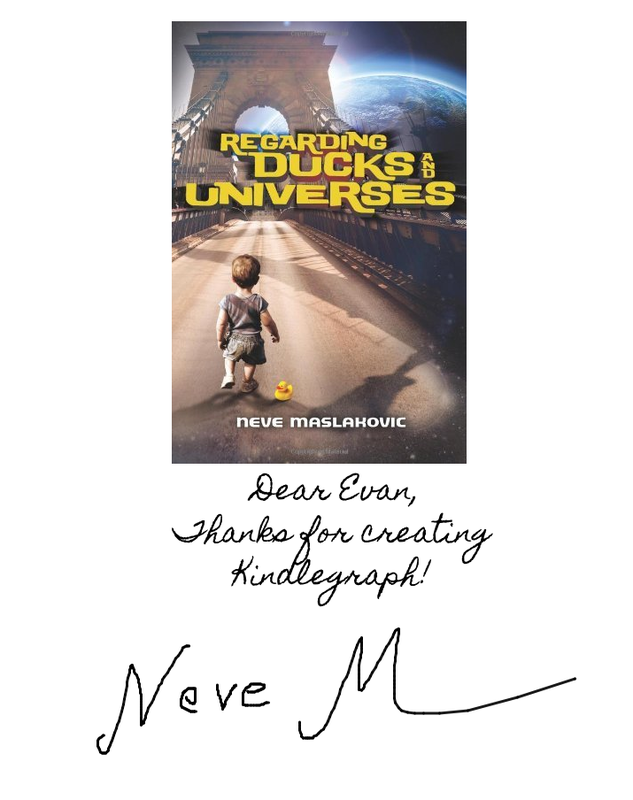 Neve Maslakovic: Signing a Kindle book - Kindlegraph! Signing a Kindle book - Kindlegraph! 1. Ready acid-free pen and open book. 3. Think of something pithy and witty to write (pithier and wittier than Best Regards if possible), then write it on the first page of your book. 4. Sign name with flourish. 5. Close book and thank the reader for buying it, etc. 1. Set up an author account on Kindlegraph.com. It doesn’t take long, but you do have to have a Twitter account, which I do, having joined the Twitterverse last month (I can be found there as @NeveMaslakovic). 2. Set up your signature. The site is still relatively new, so the only two options available are (a) type signature in a handwriting font, which looked nothing like my actual author signature; or (b) sign using the mouse. I opted for the second. It’s hard to sign with a mouse. My signature kept coming out wobbly and shaky, like I had a seriously high fever or had downed way too many glasses of wine or was under the age of five. After a few tries, I settled on a signature. It still doesn’t look much like my normal author signature—it’s wobbly and majorly shortens my last name as it tapers upward into a sweeping line—but I reasoned that a shaky one was better than the fake-handwriting one. 3. Wait for a signature request from reader, which arrives in the form of an email via Kindlegraph, type in something personalized and pithy and witty (see above), then click Send Kindlegraph. From the reader point of view, there’s a bit of work involved (though no more than getting yourself to a bookstore, book in hand, I guess). The directions can be found here, but essentially involve joining the site via your Twitter account (it’s free), then entering your Kindle’s email address (yes, you do have one). This is important: you have to add the site’s email address to the list of approved senders on your Amazon’s Manage Your Kindle page. Do this before you request the autograph; it will not be delivered otherwise. Also, make sure the wireless on your Kindle is turned on, or you might get charged a fee by Amazon for receiving the signature document. Here is my author page on Kindlegraph. Click on Request Kindlegraph -- what arrives will be a page with the book’s cover, the personalized message I write, and my electronic signature. See what I mean about the signature being wobbly and childlike??? I need more practice.